The Small-spotted Genet, Genetta Genetta, is widely distributed throughout South Africa. 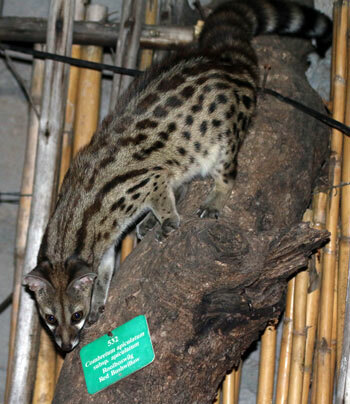 Genets have long, sleek bodies and equally long tails, short legs and relatively long, rounded ears. The general body colour is off-white to grey and is liberally covered with dark brown to black spots. These spots are smaller than those of its cousin, the Large-spotted Genet. Although both species have ringed tails, the tail is diagnostic in identification as the tip of the tail of the Small-spotted Genet is white, whereas that of the Large-spotted Genet is Black. Small-spotted Genets can become quite tame and often frequent camps and lodges. There is a fairly tame one at Tremisana Game Lodge. Its home is in the thatch above the bar and it often appears around our Boma when the guests are finished eating their dinner. As a result of the drought, we have had other animals that get through the Tremisana Lodge fence to eat the green grass in our grounds. These include Warthogs and Common Duiker. Last week a pack of Wild Dogs chased a big impala ram into the lodge area. The Wild Dogs did not enter the lodge grounds and, once they had sauntered off, the impala jumped over the fence! This time of the year it is easy to see Big Five in one day and lots of general game like impalas, zebra, giraffes and lots of elephants around the water holes or along the Olifants River. The vegetation is very dry and dusty. We have found many lions at water holes waiting for prey to come down and drink. Now is a really good time to witness a kill because the bush is open. It was a successful day and we had great game viewing. Our first sighting was of two White Rhinos feeding along the road and then a big herd of Buffalos walked across the road in front of us. The guests were confused as they did know what do – to take photos of rhinos or buffalos. We met with other game viewing vehicles and they informed us about a cheetah sighting. The cheetah were very close to the road and trying to stalk some impalas. We spent about half an hour watching them. Kruger rangers then told us about a lion kill on S90. We drove straight to the area where we found eight lions eating a buffalo. Viva Safaris has been in Kruger for 25 years and all the rangers are happy to share their knowledge of sightings ! 14-08-2016 Bushwalk and Sunset Drive. It was a beautiful morning and the birds were calling loudly. Elephants were disturbing the silence of the Nature by breaking branches. During the Bushwalk we saw giraffes, zebra and elephants. We approached the elephants on foot. It was a very good experience for the guests as we approached quite close. Across the stream there was a Black Rhino looking at us through the bushes. You will recall I had a very nasty experience with Zulu, the local Black Rhino bull so I wasn’t too keen to get too close. We did approach a little bit closer and we climbed on top of a big rock to have a better view. The Black Rhino came close enough for the lucky guests to take awesome pictures. The guests couldn’t believe it. It was so close and very relaxed. 26-08-2016 Craig and Lisa volunteers from USA – story of the month. They arrived on Friday and joined our Sunset Drive. The next day we did a morning bushwalk and then I took Craig and Lisa to the orphanage. They spent the afternoon doing shopping for the kids. They bought them school uniforms, extra clothes and shoes. It was sad for the volunteers to see kids without even one pair of shoes. On behalf of Viva Safaris, I would like to thank Craig and Lisa for good things they have done for the kids. They will always remember you for the change that you brought into their lives. God bless you both. The vegetation is very dry as a result of lack of rain. A large number of animals have moved away from Balule. This makes it difficult to find grazers like buffaloes and zebras. The dams east of Tremisana are all dry. In fact Tremisana Dam is the ONLY dam with water – thanks to the foresight of our GM who installed a solar panelled borehole. The Bush Walks continue with beautiful sightings of crocodiles, waterbucks, hippopotamus and giraffes coming to drink from the river. We are seeing a cheetah inside the Maroelani fence in the early mornings. Something so very outstanding was my first sighting of a Sharpe’s Grysbok (an extremely rare antelope) along the Olifants River. My guests didn’t realise just how lucky we were. The warthogs are appearing in the mornings and afternoons at Tremisana waterhole and the guests eating breakfast and lunch enjoy watching the animals and taking beautiful pictures. At times hyenas come in during our braai at Marula Boma. Often we also see Civet, Porcupine and Genet. The S100 in KRUGER has become popular due to the amount of hippopotamus out of the water. Lions continue to prey on them as the hippopotamus weaken. The full day drive in Kruger are very popular as our guests have wonderful sightings of the Big Five. With the seasons changing, our bushwalks are also starting to change. With the river almost empty we are getting more and more animals that are coming to the river and staying around, making sure that they will be able to have as much water as possible. Rex and I have been very fortunate to have found elephants on almost every walk. This ensures that we always have nice sightings and huge adrenaline surges. Our guests LOVE the Bush Walk!!! With so many Elephants down by the river, the afternoon drives are a lot of fun. We are seeing lots of elephants and hippos. I had a very lucky drive the other day. We had elephants surrounding the lodge before we went on afternoon drive. They even started eating the leaves of the Marula trees in the car park. When we eventually got to the Landcruiser we went on to see even more elephants and a lot of other animals. But the best was yet to come… I stopped next to impalas and enjoyed watching them run around, when we moved on I discovered that there was a Black Rhino standing behind the bush just waiting for us to finally spot him instead of the impala. We got very lucky due to the fact that he gave us a charge and made sure we knew what he was capable of. Drives are unpredictable – some nights we get everything and the next day we don’t get anything special……. But I have been more than just lucky this month. On one drive we got Lions eating a buffalo, Elephants all around the Cruiser, a massive buffalo herd and then just before we stopped we got the Rhino!!! I couldn’t believe my eyes and thought that that would be the best drive I would ever have. Until I went out a few days after that. We drove and saw nothing wonderful for an hour. All of a sudden we got a young female leopard!! After viewing her I turned around and took a different route. Not even 5 min later we got lions walking in the road!!!! An amazing month! Finally I am doing safaris in Kruger and loving it!!!! My first ever drive I was fortunate enough to have amazing guests and amazing sightings! We saw 6 different lion sightings as well as great sightings of Elephant , Buffalos , White Rhino – unfortunately no leopard but we got a cheetah. We had amazing sightings and were about to exit the park when we got the Wild Dogs saying goodbye!!! I am enjoying every moment of Kruger and I have to say the guests make a big difference and thankfully this month I have had the craziest and funniest people ever!!! Looking really fat with all the easy meals around. This was one of the most exciting months in my life when it comes to amazing sightings! The dams give us the best sightings. We’ve got a very good team when it comes to Kruger park game drives and with a good communication which brings good sightings for our tourists. We appreciate one another so much ! We’ve seen leopard killing impala, lions chasing buffalos and cheetah chasing steenbuck. We drove to S100 where 2 lionesses were stalking a Bushbuck near the river and missed it as the lions didn’t do much stalking compared to the leopard we had seen. Kumana dam has become home to a pride of 25 lions including 12 cubs. We get lions there every day – the pride recently killed impala coming to drink in front of my guests. Kumana has been buzzing in terms of the lion pride became they are active the whole day chasing animals coming to drink except the elephants and rhinos. 100m from the dam there’s this leopard hunting porcupine under the drainage line – so it is frequently around. We had brilliant sightings of a Buffalo kill on S41 with a pride of 17 lions right next to the road. On the S100 we are getting sightings of cheetahs – a coalition of 4 males. Nsemani dam has also been producing good sightings lately – lions sleeping on the road; rhinos and elephants coming to drink, and a leopard is seen frequently near the dam. 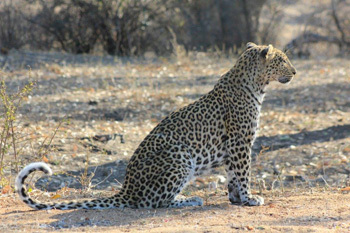 This month we managed to get leopard sightings almost every day which easily tells how good game viewing was this month. On the downside, the drought continues to threaten hippos, warthog and wildebeest. Bushwalks at Marc’s Camp have been terrific lately – we managed to see Black Rhino and Buffalos ! This month has started out very well I must say. The sightings have been phenomenal. Several times this month I have managed to get multiple leopard sightings in the Kruger as well as in Balule. On many of the days in Kruger we got all the big 5 and cheetah as well. Wild Dogs have been scarce, but that’s understandable considering it is their denning season. On one of the days in Kruger I managed to get 4 out of 5 – lacking just the leopard – all before lunch. There were amazing sightings of White Rhinos near Orpen and then an amazing sighting of 3 lions right in the road. Then after lunch came a really good sighting of leopard. We got 2 leopards that day. One wasn’t a very good sighting because there were many cars around and the leopard was hidden behind branches eating its kill up a tree but then I took another road where I had seen multiple leopards and not too far down I managed to find another beautiful female leopard right next to the road all alone. There weren’t any other vehicles around and we had her right next to the Open Vehicle for about 15 minutes. Then on another day we found a big pride of lions at Kumana Dam and the females were alone with 11 little cubs right next to the road. I went down the same road where I previously had seen multiple leopards. Not long afterwards I saw a nice male leopard right next to the road but he was quite skittish and then soon after the same young female I had seen previously right next to the road stalking a steenbok. We sat with her for at least 40 minutes. 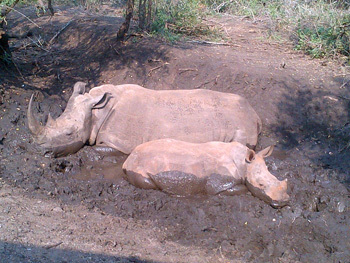 The Black Rhino sightings have been very good too. On multiple occasions on drives in the Balule game reserve we managed to find a female with a calf as well as our elusive resident male black rhino. The cheetah that previously found its way into the neighbouring private property and was successfully relocated back on Balule has managed to find her way back into the property and that has made things a little easier to find her as she is often seen along the fence sunbathing in the early morning. I do all my drives and walks on Balule. Compared to Kruger proper, it has been disappointing as a result of the constant movement of animals in search of food. Sundowner drives have produced elephants and buffalo regularly, with hippo and crocodile on the Olifants River. Lion sightings have been scarce but we have had sightings of the pride of 9 on a buffalo kill. The male lions have found holes in the fence and are often on the adjoining property – not good for our chances of seeing them. Bush Walks have, as always, been very much appreciated by our guests. We are leaving earlier now as the days are getting longer and we can see our way around at about 05h30. On one walk this month, the route back to the vehicle was blocked by a herd of elephants and we had to wait it out until it was safe to head back to the vehicle. Took us about ten minutes to get back – great experience. On another Sunset drive, we found ourselves in the middle of a herd of elephants, with the babies all rushing towards their moms for safety. My guests just loved it !! On most bushwalks right next to the Olifants River, we stop at a beautiful rocky outcrop and enjoy the view. Hippos are not far off from us and begin to stir in the water due to our presence – not a good time to go swimming. This month we have enjoyed sightings of both White and Black rhino – I tell the guides that go into Kruger Park that they very seldom get Black rhino although James and Bongani reckon they never miss White Rhino. The general game have spread all over the reserve, heading out in smaller groups looking for something nutritious to eat in the very dry conditions. I hope we get rain soon and then the animals will stop trekking all over the place and settle down – in so doing we can be assured of more regular sightings. It has been a lovely month for game viewing as the weather is great and animals have been giving us some good sightings. They have been rather good for me. I always get at least one of the “Big 5”. Elephant sightings are the most common. There has been also been only a few sightings of lions – a bit quiet this month. The drives have been good with sightings of Elephants, Buffalo and even Cheetah. Once it gets dark it always gets a little quieter with sightings but the emphasis changes to nocturnal species and we have had great sightings of porcupine, hyena, civet, scrub hare and genet. The camera trap at Tremisana waterhole shows lots of late night activity and there have been shots of lion and leopard. I am particularly pleased to see the Bushpigs are back ! These have been my favourite this month as they have blessed me with some great sightings of elephants in particular. 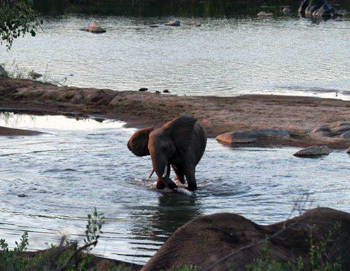 We have seen anything between one elephant and a big herd of around 30 with babies all playing in the Olifants River on the drives. We had a bachelor herd walk right next to our game viewer on their way down to the river but one did a detour and pushed over a Marula tree after which he stood eating everything then the other 7 came and joined in. The other great sighting this month was of a leopard. It was a beautiful, relaxed female standing right next to the road. On the one drive there was a pair of honey badgers running on the road then later on that drive I got another pair by Tremisana Dam followed by two porcupine. During the walks we had some great encounters of elephant and really special giraffe close ups, making the walks even more enjoyable. During the walks along the river we always see the hippos in a pool of water in front of us and on some occasions the hippos are lying on the sand bank. Not to forgot the great crocodile sightings. The afternoon draws to a close as the sun starts to drop in the sky over the Drakensberg mountains. The game viewer is full of excited passengers all hoping to see something memorable, and for some it will be their first safari. We head off with the wind blowing through our hair as we go into the wilderness – it doesn’t take long before we find our first animal. It’s a beautiful impala prancing in the late afternoon light – taking in as much food before the sun sets and the night takes over. We keep on going passing tree after tree, not all upright but some pushed over by the kings of the African bush : the elephants. It is not an elephant we see next but a herd of buffaloes, moving along the road enjoying the small amount of grass still available. Some get so close you can almost touch them, as they slowly saunter passed following their leader. We continue on to a great giraffe sighting – four tall males walking along the road in front of us and then duck in amongst the trees to feed. The radio breaks the night’s silence and the news it delivers brings great excitement – lions have been sighted not far away. We head off in the direction suggested, and notice a small group of vehicles with their spotlights all pointing in the same direction. It is the lions – a pride of seven, all digging into a buffalo, we have a perfect spot watching them as they rip chunks of meat from the carcass. We spend the best part of an hour watching these massive cats do what they do best – eat. After the show it is time to head for our famous Marula Boma, our beautiful dinner venue. The night isn’t done yet, with an incredible rhino sighting still to come. We have all been wishing for a rhino sighting. There it is right next to the road – its huge form unmistakable. We feel honoured to be in the presence of this incredible animal threatened due to human greed. With winter coming to an end, the days are getting longer, the sun staying high in the sky longer than usual. This means that Kruger National Park closes 30 minutes later than usual. The fact that we have an extra 30 minutes means the drive back is more relaxed. 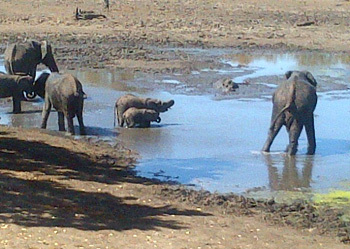 The warmer weather also results in some amazing elephant sightings where they are swimming and playing in the mud. On most of my drives this month I found the Big 5 and more with only a very few days missing the Rhino or Leopard. This has surprised me due to the fact that these two last-mentioned species are usually more difficult to find. We have had exceptional sightings of Cheetah walking right next to our vehicle, a leopard hunting an injured Impala, Lion walking past the vehicle and a pleasant surprise one day on the S100 of a Honey Badger digging around for food. We have been mostly going south towards Kumana Dam to find animals. On one of my recent drives on my way back from the S86 loop we were fortunate enough to see a young female leopard walking in the middle of the road, stopping and stalking when she spotted a squirrel in the road. Fortunately for the squirrel, he saw her in time and managed to escape. Another special but fairly intimidating experience I had this month was with a breeding herd of Elephant. One of the cows was not happy with our presence so I decided not to pass them until she calmed down. Then more members of the herd arrived and circled our vehicle while feeding cautiously keeping an eye on us. Then the Matriarch walked straight up to our vehicle stopping about 2 metres away from us. She stared at us for about 5 minutes without moving. One of my guests made a sudden movement and she showed her disapproval. One of the calves approached us and this worried me as they are very curious and by getting too close could place us in an even stickier situation. After waiting a few more minutes without moving or starting the vehicle she decided that we were not a threat and left us to pass the road. Whew !!!! I had the opportunity to guide a group of guests that were interested in birds. With this group we stumbled upon a Giant Eagle Owl that had just caught a squirrel, spotted by one of the guests, Alexander. Other birds we saw included the Lilac Breasted Roller, Bateleur Eagle, Brown Snake Eagle, Purple Roller, White Backed Vulture, Crested Barbet, Goliath Herron, Saddle Billed Stork, Martial Eagle, African Spoonbill, Egyptian Goose, Magpie Shrike, Southern Ground Hornbill and many more. The last week has been a week of good sightings as we witnessed lions mating a mere 20 metres away from our vehicle! The previous day we stumbled upon a female Leopard spraying over a tree, marking her territory. What I find so exciting about going to Kruger National Park every day is the fact that every day is different, the animals interact with one another and we get to see them going about their daily activities. This is what makes Kruger National Park so special and Viva Safaris’ guests really find the full day very worthwhile !! 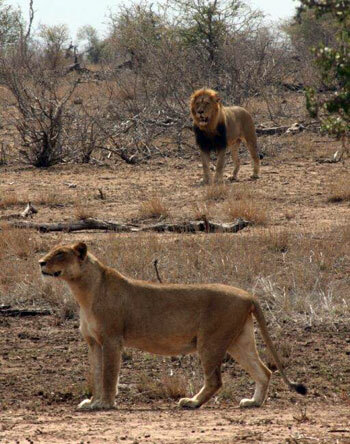 1st August : Kruger Big Five : lions at Timbavati riverbed, White Rhino near Orpen, Leopard phelwane bridge, Buffaloes muzandzeni and more elephants at Ssweni, S100 dead hippo with male lion. 6th : Big Five again : Kumana dam a pride of 5 lioness, 5cubs and two young males, Whte rhino and calf coming to drink and plenty elephants , Buffaloes at Muzandzeni and Leopard on Timbavati riverbed. 11th : Lions Kumana dam, Leopard at S86 junction, White Rhino near Nkaya pan ,two male lions on S 100, Buffaloes at Orpen gate ; elephants everywhere but no leopard. 21st : Leopard at Orpen, 2 White Rhinos near Orpen reception and elephants outside Orpen shop, big herd elephants at Sweni , 3 male lions at Sweni windmill, big herd buffalo on S100. 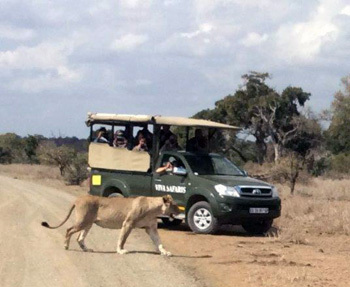 25 th : Lions crossing road in front of open vehicle at Rabelais, Leopard at Kumana Dam; White Rino near Orpen; another leopard Nsemani Dam , lions at Kumani dam , Buffalos Orpen road, elephants all over. TREMISANA GAME LODGE has been awarded the 2016 Certificate of Excellence from TRIP ADVISOR. Thanks to our dedicated staff who work hard, year after year, to provide a homely and caring environment to the ever-increasing number of guests that book safaris through Viva Safaris. Despite the lack of grass, we are seeing large numbers of animals around Tremisana as they make their way to the waterholes in front of the Lapa as well as the Tremisana dam. The animals do not linger – they quench their thirst and move on looking for pasture. Elephants have been around and the trees are looking ravished ! Our guests are entertained by the monkey troop and there are always warthogs, guinea fowl and Banded Mongoose around the waterholes. MARCS TREEHOUSE LODGE has also been awarded the 2016 Certificate of Excellence from Tripadvisor. Thanks again to our committed staff !! The camp is looking good despite the drought. 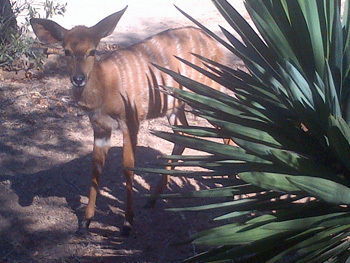 The Nyala are always seen around the camp and are relishing the leaves that are falling off the trees. Our guests hear lions and hyena every night and both Buffalo and Black Rhino are being encountered on the Bush Walks. Allan reports : We have really had a good month with many guests. Our early morning bushwalk has delighted the participants in that they walked into a Giraffe one morning. One can only truly determine the size of these gracious animals when one is close up and on foot. We also got to see a Black Rhino from up close. A wonderful rare sighting. A difficult beast to find even by vehicle! Well done to our resident guides. The sleep out Safaris are making headway. Our resident monkeys are still doing their best to entertain us every morning. Our bougainvillea is flowering near the pool, and sheds its flowers throughout the day. These petals are gratefully received by our resident Nyala as their feed is so limited because of the drought. We pray that the rains arrive soon. KATEKANI TENTED LODGE has undergone a reasonable increase in occupancy. Bushbuck and Wildebeest are seen regularly at the Boma and the night calls of Hyena, Jackal and Lion add a wild touch to the experience. We are thrilled that, to a person, all our guests are wowed by the tented units – in almost every case, the guests cannot believe how spacious and well-appointed the units are. Elena reports : Katekani is been discovered as more and more guests are coming here and are truly flabbergasted ! The reviews bear testament to the different nationalities writing their assessments in their mother tongue. Although there is still a bit of a nip in the air in the early morning, we are having wonderful spring sunshine throughout the day. Our resident bushbuck seem to have now accepted us and enjoy parading themselves at the Boma, much to the guests’ amusement. We will be opening an additional two units at Katekani Tented Lodge on or before 1 October 2016. This brings the number of beds to 12. We remind you that Katekani does not cater for children under 12. Our 4 day Sleep Out safaris have done well this month. We have received a detailed review from one of our very first participants – this is published further down. We wish to remind you that we conduct these 4 day Sleep Out safaris departing only on Mondays, Wednesdays and Fridays. August 2016 set yet another new record in terms of arrivals per month – we are up over 50% on August 2015. Thanks for your loyal support !! Included below please find reviews posted on Trip Advisor in August 2016. I took the 4 days sleep-out safari and the sleep out was actually beyond my expectations! I couldn’t find any review about the sleep-out, but found out that it’s quite new and apparently I was one of the first person who did it. And I’m so glad I did! I was a bit surprise the first evening when I learnt I will be alone with my guide, but David was really awesome and I felt really comfortable and welcome. He really took good care of me. I really appreciated to discuss with him about anything but also to enjoy in silence the beauty and the sounds of the bush. The manager Luke kept my valuables at the reception and gave it back to me on the last day, so don’t worry if you have a laptop, passport or else like me. Definitely, this 4 days sleep out isn’t for you if you’re looking for luxury, but if you look for an unforgettable adventure and a real sleep out under the South african stars and in the middle of the bush with the sounds of the animals (heard hyenas, lions and more! ), just book it ! It’s also really respectful of the nature and of the animals, and we always took good care of not letting anything in the nature. The second day I was most of the time alone with my guide David and it was really great for the bushwalk! Don’t expect to see animals at every corners, but it definitely is a beautiful experience and, in my point of view, really respectful of the animals. David told me about the tracks, the animal’s behaviours, we even played with a little hidden spider and I really learnt a lot. The walk next to the Olifants river was also really beautiful! The food was basic but nice, don’t forget that you’re in the bush! And had a delicious breakfast with toast made on the fire 😉 In the evening of the second day, David cooked a nice BBQ and we could hear the hyenas attracted by the smell 😉 And it’s definitely an experience to go to the ”nature” toilet in the middle of the night and hear the lions! 😉 I always felt perfectly safe, so don’t worry. I spent the last evening and dinner in Marc’s tree house camp, which has a really good atmosphere and is great to meet other people as we all sit on big tables for dinner or around the fire. The next morning we had a last short bush walk with Victor, who is really knowledgeable and has a lot of fun stories about his childhood. Really a great and friendly person ! I could have even spent more time sleeping outside and discovering the animals 🙂 It could sound a bit scary ”sleep out in the middle of the bush”, without any tent or fence around, but I can tell you I will keep this experience in my mind forever and I wish I could do it again ! As we say, why paying for a 5 stars hotel when you can sleep under billions of stars ? A huge thanks again to my guide David, you’re really awesome !! Room Tip: No need for a room, be adventurous, take the sleep out! I wanted to take my whole family, (8 of us – 7 adults and 1 child) for a safari and am so pleased I chose Viva Safaris. Our ages ranged from 13 to 84 so we were quite diverse, but everyone was accommodated. The more adventurous of us went on the bush walks and saw a black rhino, which was heart stoppingly fantastic. We saw every animal we wanted to and more and close up. The drivers were informative and friendly and polite. The first night braie in the bush was really in the bush and we saw hyenas cleaning up our bones – what a start to the holiday. The accommodation in the tree houses was unbelievable and such a great experience. The food was freshly cooked and lots of it – different every day and the staff serving were very happy. I was anxious that this wouldn’t be all I wanted, but it more than surpassed my expectations and we all had a great time. I wouldn’t hesitate to recommend this to anyone, in fact, I would insist you couldn’t get better for animals, accommodation, staff and safari experience. Room Tip: Get a Tree house. Wow wow wow, this was one of those very few experiences that exceed our expectations in every way. Elena, Allan, their daughter and their sweet crew, made us feel so welcome and gave the lodge a homey feel. The food was very very good, so tasty and something for every taste (our two picky daughters had no problem getting full). The Laba with it’s beautiful fireplace and cosy interior is a great place to relax and talk to the other guests or just relax and listen to the lions roar. 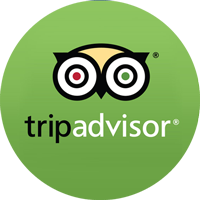 Read more reviews for Marcs Treehouse Lodge, Tremisana Lodge and Katekani Tented Lodge on TripAdvisor.